When I started this blog a couple of years ago, my intention was to write about the lifestyle and culture of the Adirondack Mountains in upstate New York. The decision came easily and seemed like a good idea at the time. I earn my living as an independent consultant, a writer, and a real estate agent, so why not market my product, the Adirondacks, in the most fun way for me - write about it. Two years and two months later when I think more seriously about why I take the time, I realize there are a number of more solid reasons I wake up most days constructing sentences in my head. 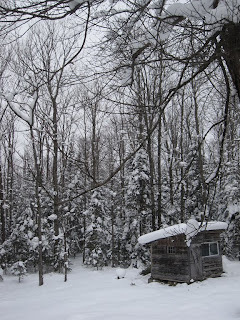 The two most important reasons I do this are: I love living in the Adirondacks and I am a writer. Yes, we all knew that part, but the epiphany hit me yesterday like a ton of frankincense; I am actually following some old advice from an elderly and slightly eccentric British gentleman and writer who befriended my family 27 years ago. Back then, when I was just starting out as a writer, I had the good fortune to live on Towpath Road, in Alligerville, New York, across the pond from a distinguished and famous real writer, Mr. Edwin Tetlow. A columnist for the UK's Daily Telegraph, Mr. Tetlow happened to be in Havana, Cuba in 1958, planning to write about the local New Year's celebration, when Fidel Castro decided to grab power and then President Batista ran for his life. Edwin Tetlow got the scoop because he was the only British correspondent on the island, and the rest, as they say, is history. By the time I met Mr. Tetlow, he had retired from his position as a award-winning foreign correspondent, had already published a few books about Cuba, and was in the thick of writing his Battle of Hastings books. He was 76 years old and wore an ascot every day even though he lived in the middle of nowhere and saw only our family on his daily walk to the spring. At the time, he was my hero. I was the brand new "PR girl" at the hospital in nearby Rhinebeck, New York. But, more than anything, I wanted to be a foreign correspondent. I attended University in Europe for a year during college, was fluent in German, dabbled in French, and was anxious to get going on that career. Our family spent a lot of time with the Tetlows, Edwin and his wife Kay. Deep in the Catskills, they were our closest and only visible neighbor at the bottom of the Peterskill Creek, where it emptied into the Rondout River. They occupied the Toll Keeper’s estate on the old Delaware – Hudson (D & H) Canal and we rented the old ax factory farm house across the pond. Edwin liked to pretend he didn’t like children and came up with the nickname, “BN” for our two-year-old son Eddie. BN stood for “Bloody Nuisance,” of course. I once heard him whisper to a guest however, that he had never seen a more entertaining and astute two-year-old, and a Yankee at that. Mr. Tetlow was great with monikers and nicknames and was the first to correctly brand the resident biologist, husband Ed, a “Sterling Chap,” an apt nickname as anyone who knows Ed will concur. It was Kay, or Mrs. Tetlow, who cultivated my then green interest in flowers and gardening that blossomed into a full-blown obsession. Mrs. Tetlow was a classic; a refined English Lady who loved the country. This was a woman who organized a dinner party around the delightful news that we planned to butcher one of our hens who had stopped laying eggs due to old age. Kay put the dibs on the old hen’s fat to use in a special English dish whose name I can’t remember but with a taste I still try to forget. I have a ton of great Tetlow memories, from the time Mr. Tetlow walked down Towpath Road to our house to see if Ed had a moment to accompany him back to his property in order to render a second opinion on whether or not his carriage house was on fire, before bothering the fire department with a call, to “interesting” circa-1950 British child-rearing wisdom imparted on almost daily garden walks with Mrs. Tetlow. Back to the matter at hand however, which is why I write this blog. It was Mr. Tetlow who broke the news to me that in order to be a writer you have to write about what you love. He said your best writing will come if you write about that for which you have a deep passion. I think Mr. Tetlow knew what he was talking about. The Adirondacks and spending time outdoors are two of my passions. So even though it didn't take days of ponderous musing and a strategic plan to reach the decision, it seems writing this blog is a good idea.